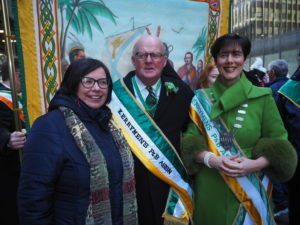 The Cathaoirleach of Kerry County Council, Cllr Norma Foley and the Chief Executive of Kerry County Council, Moira Murrell joined the New York Kerry Association at the annual St Patrick’s Day Parade on 5th Avenue in New York on Saturday. Over 2,000 people of Kerry descent joined 200,000 other marchers in what was the biggest parade in recent years. The Cathaoirleach and Chief Executive met the President of the Kerry Association in New York, Frank O’Keefe and other officers and thanked them for all their support for the Kerry GAA Centre of Excellence and other initiatives. Earlier they joined the Mayor of New York, Bill di Blasio for an early morning reception at his official residence, Gracie Mansion. Among the other invited guests were the Minister for Justice and Equality, Charlie Flanagan and the current Rose of Tralee, Kirsten Maher. On Friday, the Kerry delegation which included Tourism Officer, John Griffin, held separate meetings in Ireland House with senior executives of IDA Ireland and Tourism Ireland to discuss further investment and promotional opportunities for the county. 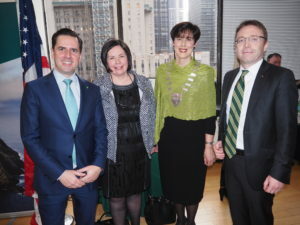 They also met with members of the Ireland America Business Council and attended the launch of the Ireland-US Business Review 2019 hosted by the American Chamber of Commerce in the Irish Consulate.